I also hear that story quite a bit and have my own experiences with being or at least feeling stuck in a job that was not right for me. I think there is a whole lot of this and there are probably many varied reasons that so much of this exists. I think that the vast majority of it can be broken down by a simple diagram that I have become a big fan of. For starters, are you willing and able to honestly ask yourself if you are happy. Instead of raising hell about what is wrong with everything around yo…are you happy? If the answer is no, then you are ready to move to even more actionable question…do you want to be happy? 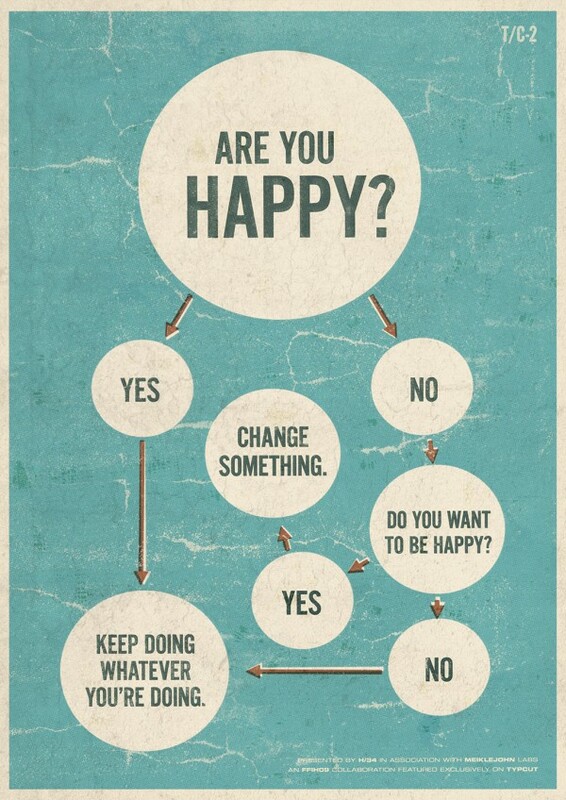 If you do actually want to be happy, then change something. Repeat. Forever. Simple questions, but I think that they are questions commonly overlooked or ignored leading us to lose sight of our personal choices and our personal power. Simple questions do not necessarily lead to easy actions, but they do help us keep our eye on the prize. We love to claim this “give me liberty or give me death” approach to life, but I think we don’t much love liberty or death. I think that what we are naturally pulled toward is the comfort of what we already know. Action brings uncertainty and risk. Feel right at home with your straightforward approach and sense of humour. I’ll posting the diagram at work and home. The comment you made about personal power resonates with me as I never believed I could make a difference. A life changing event – my daughter becoming severely mentally/physically disabled at age 5 – has helped me discover my strength and ability to make a difference.